ezravdb doesn't have a personal statement currently. I am Ezra, I am just letting you know I am back heavy into the guitar again. Maybe one of you remember me from my aspiring instructor lessons. I've sold my Line6 pod xt and I now own a Digitech Whammy, Boss Distortion,Digitech Digital Delay and a Dunlop Wah. I just recently finished a track called A New Beginning. Buckethead fanatics may recognice one of the chord progressions. I now work with Fruity Loops and Guitar Rig 4 and M-Audio Fast Track instead of Reaper.
) know that I'm back on the site again. I came up with this last week and made a song of it a few days ago. First I want to thank all the people who checked out my previous lesson, I can't believe it has almost 5000 views. And thanks Kris for putting my lesson on the front page, it was an great honor. And thanks for all the nice comments. Welcome to my second lesson as an Aspiring Instructor! This lesson is built on a riff with lots of power chords and some harmonics. The lesson starts with an "Intro Riff" and when the drums, bass and rhythm guitar kick in the Main Riff starts. For the drums a made a standard Rock Beat, I find that it really suits this riff. The bass guitar and rhythm guitar play about the same, except for that the bass guitar plays some octaves on the G chord. The lesson is not specifically in any style (except for the riff) but there are some licks who are reminiscent of a few players. The lesson contains string skipping, double stops, open string licks, pentatonic runs and funky octaves. The music is on full speed at 140 BPM, the time signature is 4/4 and the key is Am. This riff is inspired by AC/DC and Van Halen. As you can hear most of the riff is played with power chords. I also play a quarter bend on the seventh which creates a cool sound because it leans towards the tonic. There are also some natural harmonics like Eddie Van Halen does in his riffs. At the end of the Main Riff I play 4 harmonics, these are actually 2 G notes in 2 different octaves. When the Backing kicks in I scrape my pick against the strings. Play it like you mean it !! This lick is the melody and this groove will come back later in this lesson. This melody has to flow, play it with legato. This is a Paul Gilbert type of Pentatonic (speed) Run, but this one is in 16th notes and not 16th triplets. It ends on an Artificial Harmonic. The Artificial Harmonic note I play here is the same note as you hold with your fretting hand but 2 octaves higher. This lick is a bit longer. The lick holds the groove of lick 1 but with different notes. I end with 2 G Major Triads end a bend. This is an open string lick ala Joe Satriani. I play the A minor Blues Pentatonic scale on the A string. I go till the end of the fretboard and land on the note G.
Here I play a melody with double stops. Pay attention to barring your ring finger on the G and B string. This is the continuation of Lick 5 and this also is played with double stops. When I play/hear this I have to think of Gustavo Guerra! Pay really attention to barring your ring finger on the G and B string by this one. Find the right spot on your ring finger where both strings are fretted. You also want to bend your thumb over the neck so you can really grab the strings with your index and ring fingers. This lick is played with Octaves. The second half of the lick is one Octave higher than the beginning part. The lick holds the groove of Lick 1 and I pluck the Octave with my ring finger. Picking all the notes will do the job too. Pay attention to the slides in this one. The rhythm of this lick comes from the slides. The lick in played with string skipping and octaves. The picking of this lick is kind of up to you. You can alternate pick the whole thing but that can be hard with the string skips. What you can also do is down strokes on the E string and alternate pick on the D and G string. I don't really think when I play this lick. My picking is kinda random on this lick, sorry. Practice trills with your pinky and ring finger and you're going to nail this lick in no time. Pentatonic, nice way to end your playing. That was the last lick!! With the fast octave string skip technique you can create groovy licks but you can also use it as a note in the base. The important thing to pay attention to with double stops is that you have to bar the strings really good. but with experimenting you will find the right place on your fingers. I hope you will get some cool new ideas from this lesson and inspiration. Have fun and Good Luck practicing! Welcome to my first lesson called "Shred 'N Roll" on the Aspiring Instructors Board. My name is Ezra van den Bosch and I live in Holland. I'm 15 years old and I've got 3 years left to do on school. I play the electric guitar from my 14th birthday and I love it. December 9th I'm going to turn 16. When I'm not practicing I'm either doing schoolwork or skating/having fun with friends. like Joe Satriani because of his awesome songwriting skills. 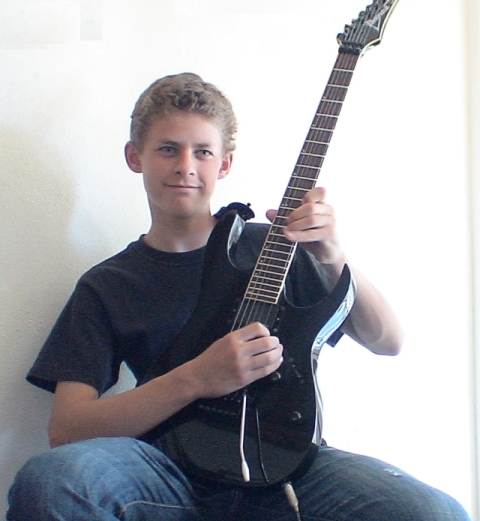 I like playing Classic to Progressive Rock, Metal and Country/Blues styles plus I find shredding fun to do. The bands I like most are Van Halen, Guns 'N Roses and Rage Against The Machine. Soon I'm going to record a demo with my personal teacher and I'm going to look for a band to join near my hometown. My guitar is an Ibanez RG Prestige with active EMG's and a floating tremolo system. I use 1 huge guitar pedal which is the Line6 POD XT Live and I plug that into my computer. This lesson is in the style of Paul Gilbert (which is in high demand) and Stevie Ray Vaughn. The 2 guitar players mixed together is what I call Blues Shred, which is really fun to play. Paul Gilbert is popular in the Shred Scene and played in Racer X, Mr. Big and plays solo nowadays. SRV played in Double Trouble did unbelievable great blues work, and now rests in peace. Check out SRV's awesome song "Scuttle Buttin'"!! You'll find some of the licks I used. The Lesson starts out with a Rage Against The Machine influenced riff in E minor pentatonic with the added blues note (b5). Then the Bass Guitar and Drums kick in. The Bass Guitar mainly just plays the same riff as the Rhythm Guitar. The Drums go with the groove of the Main Riff. flashy 16th triplets runs and some bluesy licks. The piece is at 100 BPM on full speed. The Main Riff is inspired by RATM which is one of my favourite bands. I slide with my ringfinger to the 7th fret. The Blues note makes this riff sound extra cool. This lick starts with a little grace note on the 2nd fret on the D string which is the root note of the piece. The note after the grace note (2nd fret g string) is played with the same finger as the grace note which is the ringfinger. This Lick is very SRV-ish, check the song Scuttle Buttin' and you'll notice. This lick is also in SRV style. The double stops on the 14th frets are played with the ringfinger, it's with pinky AND ringfinger possible too. However pulling off is a little bit harder. Just a cool way to go up the scale in Gilbert style. This crazy lick is hot, it's all in 16th note triplets. It's a segment of Paul's hardest lick he ever recorded. The notes are taken from the pentatonic scale but are played like a regular minor scale. so start really slowly!! The first 3 notes of every pair of 6 notes are hammerons. This lick looks a bit like Lick 2. We begin with an octave skip and than double stops. SRV uses these double stops in the solo "Scuttle Buttin". For the dead notes don't forget to lightly touch the strings AND palm mute a little bit. The palm muting makes sure you won't hear any natural harmonics! This lick involves a bend which you don't see often. let the E string slip and stop the string from ringing with your right hands finger (or palm). Put your ringfinger on the string below, the B string, and act as if it's a prebend. Look carefully at the video!! Practice this part really good because this technique gives a refreshing sound instead of just a normal bend. The rest of the lick is pretty straight forward. The Picking is the same as Lick 4. This chord is a Em7. SRV is familiar with this shape, it sounds really cool. SRV likes to play a major 3th on the 6 fret of the D string which is called a E7#9 whre #9 stands for minor 3th 1 octave higher. That chord has a "jazzy" sound. But this piece is in minor so I played a Em7. Make sure to let the notes ring but not too loud because it will sound a lil' bit messy, so palm muting a little bit with your right hand would be great. This lick is a variation of Lick 2. It's played almost the same. This lick is played in groups of 7 notes (!). It flows really nice. You don't have to worry a lot about the weird note length because it will go naturally. If it doesn't work for you practice slowly with the metronome and make sure to accent the first note of every group really well!! Practicing with Guitar Pro works great too! This lick is a typical Paul Gilbert lick, especially because it involves string-skipping. Paul Gilbert uses this technique a lot because sweeping doesn't work for him (he says). The arpeggio I play here is an Em7. I start on the minor third and then go all the way up the arpeggio and I even tap one note with me picking hand. I only pick the first note on every string, the rest is hammer-ons and pull-offs. Damp the strings which you don't play with the palm of your right hand, and the left hand fingers. This lick consists of 4 double stops going up the neck with the power chords. We end this piece on the root: an Em power chord. That was the last lick! because these are very common in Paul Gilbert's playing. Also spend lots of time with the double stops and fast bends because SRV uses them a lot. I think that wraps it up for this lesson. Do you Have questions? Feel free to ask me! I've included a Guitar Pro 4 file of the Lesson so everybody can view it. Backing Track is sequenced with REAPER. The camera I used is a Sony DCR HC90E. I used Toontrack's EZDrummer for the Drums, and 4Front for the Bass. Everything is composed in Guitar Pro. I see ya in the Forums. I saw a advert on a dutch marketplace on the internet about a Joe Satriani guitar pick. The owner of the pick said he catched it when JS threw it at the crowd after Surfing With The Alien. How much would you give for a guitar pick of JS, while you aren't SURE it was from his concert? Because you can buy his picks on the internet too. but now I'm hesitating (doubing?) to buy it and instead buy a 10 pack for 7 dollars.... LOL!